If you're part of an organisation on Figured, then you'll have access to Your organisation which lives on the main Figured dashboard (my.figured.com). Within this tab you'll be able to manage the various settings, users, and farms that make up your organisation. Under the farms tab you can review all the farms that the organisation has access to. To grant organisation access to a farm, check out this article here. Here you can see when a farm was created, the subscription it’s on and the account it's being billed to. To quickly edit billing details just click the Actions drop down menu and assign billing to the organisation if it isn’t already. Under Edit you can set a Billing reference for each client. The people tab is where you manage all the members of your organisation and their access levels. To add a new person click + Add new person in the top right hand corner. 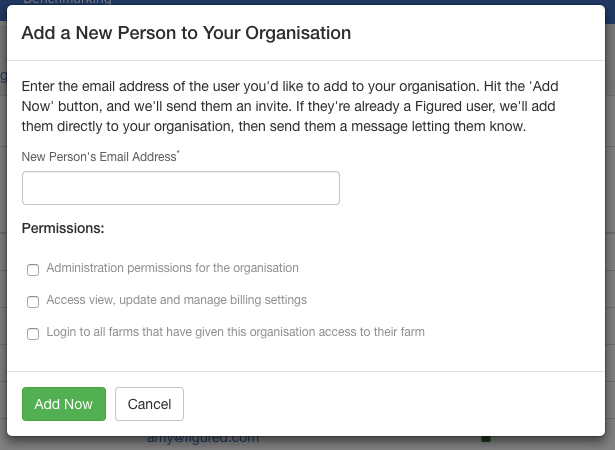 Enter the new persons email address and select the access permissions you want them to have. To edit existing members details just click the users name to access their profile. In here you can edit the users name, job title, permissions and remove organisation access if they’re no longer part of the organisation. Once happy with the settings just click Save changes. Those with Admin and Billing access to the org have the ability to change the details under the billing tab. Here you can manage the contact and billing details for the organisation. It also has a list of all the farms that are being billed to the organisation as well as the ability to view and download PDF copies of the organisations invoices. For more information on organisational billing click here. Organisations can setup their own default livestock weights, dress out ratios and stock units which can be used in place of Figured’s defaults. These can be applied at tracker level to override Figured’s default weights or users custom weights. To find out more about this click here. Here you can change the organisation name, description, phone number, email, and location. You can also add in disclaimer footer text to be added across all exported farm reports that are under the organisation.